Freud contended that everything means something or nothing does, and Shirley Jaffe, an American painter in her 80s who has lived in Paris since 1949, would seem to agree. Since forsaking an Abstract Expressionist style in the late 1960s, Ms. Jaffe has been cultivating a brightly colored reality-based abstraction — highly distilled, subtly colored and consummately composed — that has little tolerance for pure, mute form. Her precedents include Matisse, Miró, Stuart Davis and Alexander Calder, but she explores her chosen terrain with a rigor that is very much her own. Ms. Jaffe made her New York solo debut at Artists Space in 1989. This, her fifth show here since then, backtracks a bit to review the steady strengthening of her art. As suggested by comparisons among "Grey Center" (1969), "Madame Butterfly" (1978-79), "Macon" (1979) and "Hop and Skip" (1987), crucial advances were made with the introduction of curved shapes and cursive squiggles, a freer use of white grounds and a willingness to detach shapes from the canvas edge. By "Four Squares Black," of 1993, Ms. Jaffe had definitely hit her stride. Form and the interpretation of form vie for attention. Suggestions of a dark window with red mullions set in a bright yellow wall fill the painting's top half. It may be nighttime; the jumble of furniture (a picnic table perhaps?) and plants scattered across the painting's bottom half may be indoors or out. Either way the two very different halves balance each other perfectly, proudly legible. 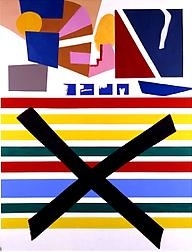 In "X, encore," of 2007-08, a large black X cancels out a lower register of horizontal bands of color. Up above, orthogonal shapes in pink and brown — with the white gaps separating them — imply the vectors of city streets and buildings. Pure abstraction, bright as it is, is rejected in favor of urban inspiration. Ms. Jaffe's best paintings are, like these, at once slyly humorous, deeply principled and robustly contaminated. Beauty is never simple or empty. It is won. It takes thought. Perhaps most beautiful of all, it is thought.